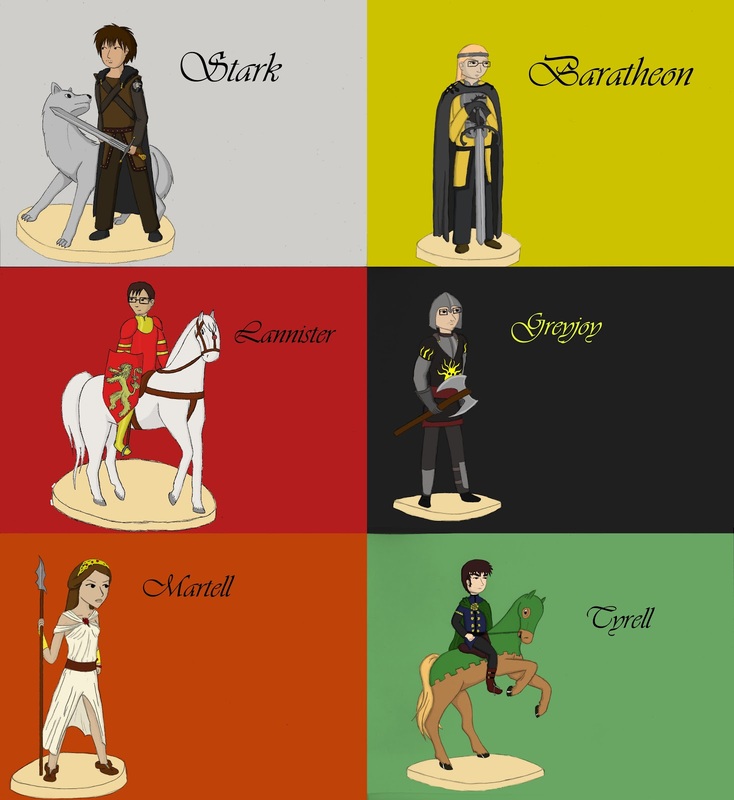 So after a behind the scenes preview posted a long time ago, and a lot of changes from what it was originally going to be like it, here we have the 6 factions of the Game of Thrones Board Game, personified by us and our friends. A fairly nerdy project, but so is the entire of What About Cynics, and it is working out great. I implore you to click for the full picture, it is really quite something my staff (singular) put together, I may just post each of them separately as well. We originally planned to make a humour set of webcomics out of these character, as Simon's Game of Thrones Articles are our most successful and widely viewed. I'm not sure if that is still going ahead, as we have plans for a story-line in the webcomic coming up soon, but it is definitely on the cards. This also historically marks a departure from the four of us, technically doubling the size of Cynics universe, but let us not focus on the grave implications for this brave Webcomic and it's fragile canon, as these guys probably won't be appearing for a while (even though I have fallen in love with Simon Baratheon). Next we will either be tackling Harvey's view on Anime fans, or kickstarting the story with the questions that did to be answered (Is Stannis or Renly Baratheon a better leader?) Until then, stay tuned, and try out all these neat buttons we've added. P.S, I was just asked by someone for the references behind them all, and I figured that probably deserves to be added on, so here we go. Stark is based on Robb, Baratheon on Stannis, Lannister on Tywin and Kevan, Greyjoy on Victarion, Martell on anyone of the Sand Snakes, or Arianne and Tyrell on Mace, or Garlan Tyrell. I'm going now I swear. This could get a cult following, what dyou think? Please make more of these, the designs are awesome! Just for the record - i swear anonymous 2 and i are not a double act! Haha, all these Anonymous (Anonymi?). It is hard to keep track of who is who. I think if we keep growing at this rate, we'll make a fine cult, it is if I see strangers wearing the (soon to be made) t-shirts that I will worry for humanity. Hope you can cope with superstardom! I don't know whether to congratulate Billy Bob or sympathize with him that he seems to have picked up a moronic admirer!